I am now placing Goma-Ae's sauce recipe up online today. 1) In a Suribachi (Japanese mortar), put sesame seeds and grind untill their oil comes out. 2) Add all the other ingredients and mix well untill sugar is disolved and looks pasty. * You can make the sauce with a food processor too. When you use a food processor, put sesame seeds in and pulse a few times and then add all other ingredients and blend it till pasty. 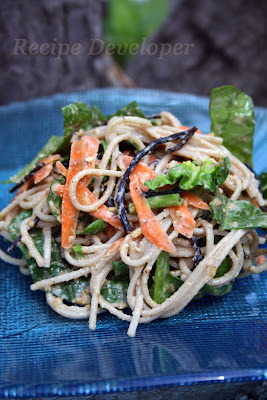 I tossed the sauce with Soba noodle, carrots, spinach, and Hijiki Seaweed. Make sure the creamy sesame sauce covered all ingredients evenly to be able to enjoy the full flavor in every bite.